Mysteries of the Crystal Skulls Explained. Scientists believe that the world is over 4 billion years old. Anthropologists state that Homo Sapiens date back as far as 500,000 years. Although natural quartz crystal has been part of the Earth since before the dawn of time, it is believed to have been used by man only during the last 12,000 to 15,000 years. Nowadays, quartz is the key component in many of our modern technologies, including telecommunication devices and computers. Without quartz, there would be no way to program the computer; you would not be able to store any memory and most importantly, it would be impossible to retrieve any information. One small chip can hold thousands of photographs, songs, movies, books, data, etc. Just imagine what could be stored in a piece of quartz the size of a human head! Ancient man may not have had computers as we know them today, but it is believed that they were familiar with the information-storing properties of quartz and therefore made use of a lasting receptacle that would be able to record, store, and transmit data for eternity. These “ancient computers” are the crystal skulls that we are rediscovering today. Rather than storing precious information for mankind in an ordinary piece of quartz that could have been lost in time, the ancients chose to store their wisdom in a receptacle shaped like a human head. These would be used in many rituals and ceremonies, and passed down from generation to generation. 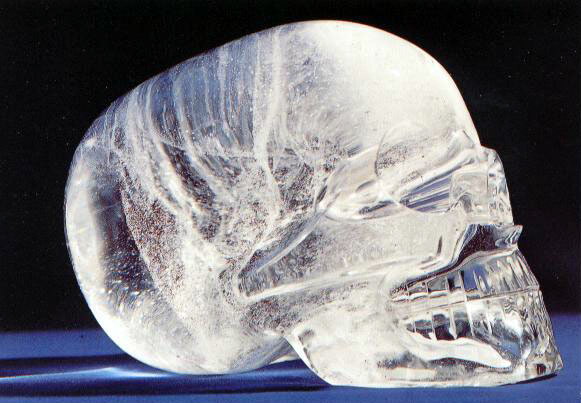 In the same way that our human skull protects and holds the brain, a crystal skull is a mind-like container that holds a generational library of knowledge – from ancient history to a blueprint of possible futures. The 13th Crystal Skull Has Been Found.The Apocalypse may now proceed. Did Indy Steal Crystal Skulls?